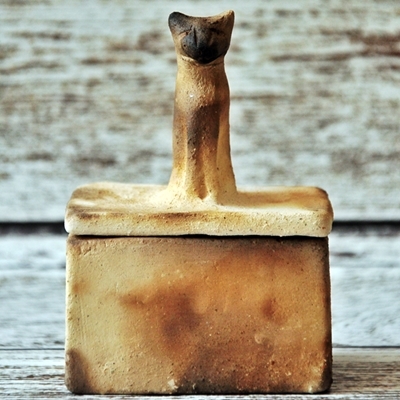 Slab built, pit fired earthenware box with an ancient cat. No two are alike, so please expect variation when ordering. 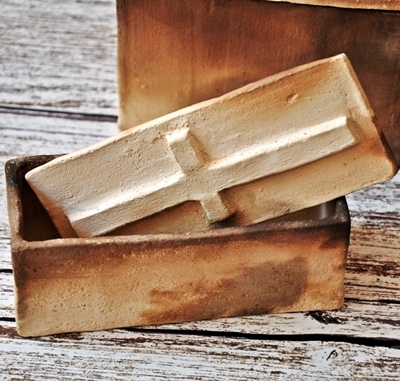 This box is the perfect size for use as an urn. It measures just under 6″ square. 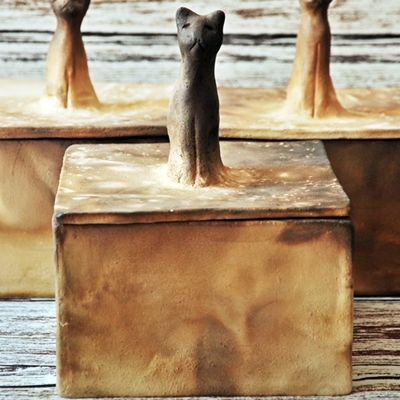 Pit fired mini cat box for your rings and things. Slab built out of earthenware clay. 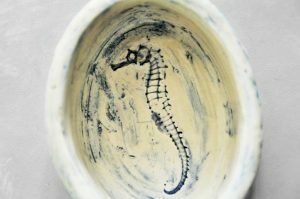 Each one is a little bit different, due to being hand made, and to the firing process which may yield unexpected results. 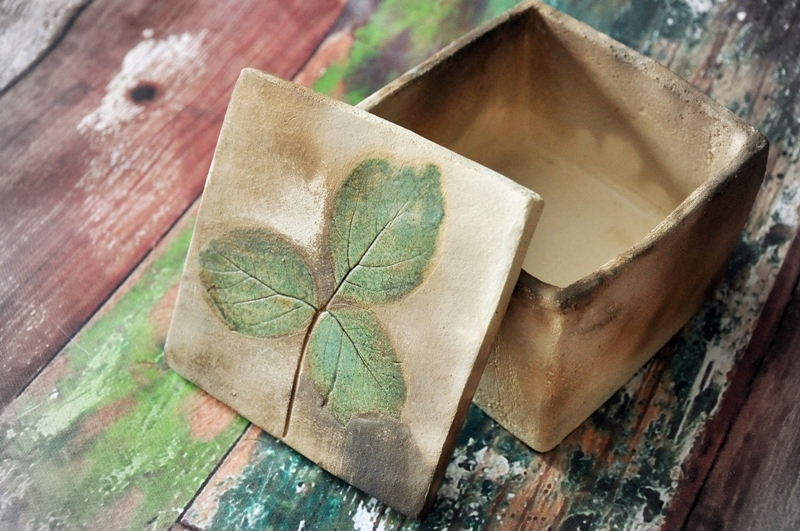 Small pit-fired leaf box, made with clay slabs that were cut and fitted together by hand. The glazed leaf creates in interesting contrast against the box’s smoke-colored body, making it an unusual piece of clay art. The perfect size for rings, and other smaller keepsake items. Measures approximately 1-1/2″ high, 2-1/2″ wide, and 1-1/2″ deep. May be ordered in a variety of leaf types. (elm, oak, willow, grass, cottonwood, maple, or click on the product title to request further customization). 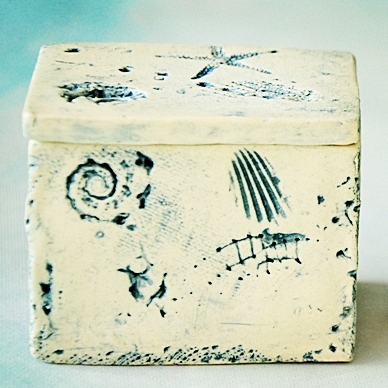 White stoneware slab built jewellery/ trinket box with blue oxide wash and clear glaze. Fired to mid range. 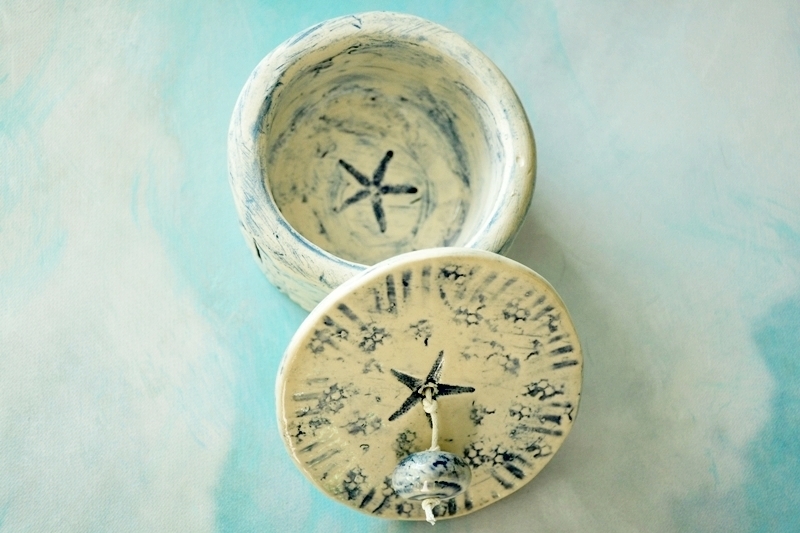 Decorated with star fish and sea shell imprints. Each one is a little different. Measures just over 2.25″ (5.7 cm) x 1.5″ (3.8 cm) x 2″ (5.08 cm) high. 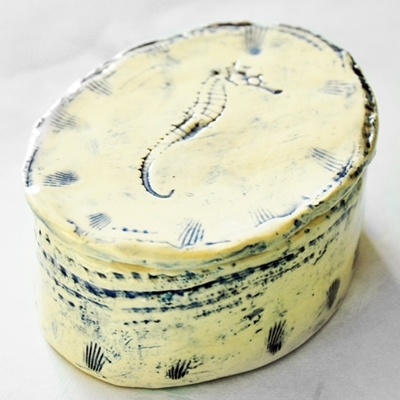 White stoneware coil and slab built box with blue oxide wash and clear glaze. Fired to mid range. Decorated with sea horse and sea shell imprints. Measures 4″ (10.2 cm) across and approximately 1.75″ (4.5 cm) high. 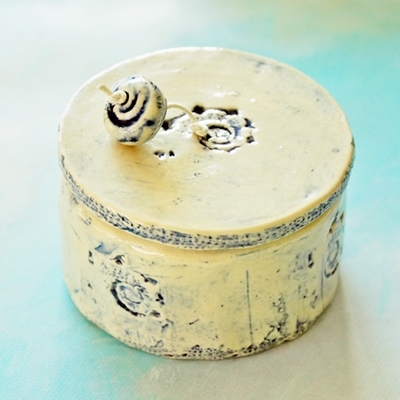 White stoneware coil and slab built jewellery/ trinket box with blue oxide wash and clear glaze. Fired to mid range. Decorated with sea shell imprints around a mermaid medallion centre. One of a kind, causal, yet elegant. 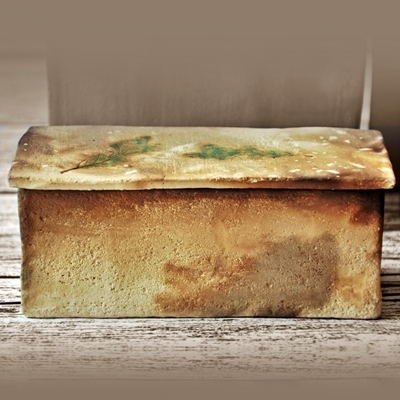 This box is slab-built and pit-fired, with the lid decorated with a central Manitoba maple (a.k.a. Box Elder) leaf. Great for storing treasures, keys, keepsakes, etc., or to place on one’s desk to hold paper clips, etc. 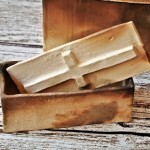 This box would also be suitable to use as a votive candle holder. 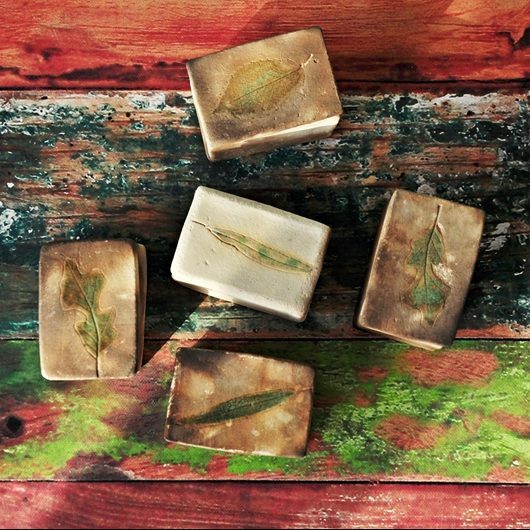 Every box is unique, with natural coloring that ranges from dark to much lighter depending on the materials used in firing, placement of leaves, plus chance elements in the creative process. This one measures 4″ (10.16 cm) x 4″ (10.16 cm) x 2.5″ (6.35 cm) deep. Slab built, pit fired box with oak leaf impressions. The leaves are glazed green. The body is mottled in hues of greys and beiges from the firing process. SOLD. Inquire about having a similar item made. 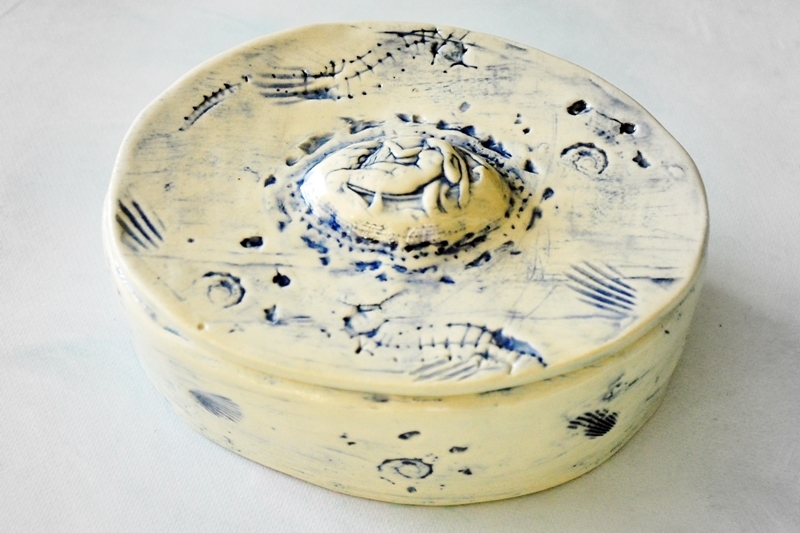 Round, coil built jewelry box with star fish and sea shell imprints. Peek inside to see another star fish there. The lid is decorated with a matching focal bead with sea shell imprints as well. Measures 3″ (7.62 cm) across by 1.75″ (4.45 cm) high. Round, coil built jewelry box with sea shell imprints. Peek inside to see another shell in there. The lid is decorated with a matching focal bead with sea shell imprints as well.